When I think about Shibley many, many things come to mind. Whether it is acres of the great outdoors, sprawling fields, bungee, tennis, rock climbing, gaga or the hundreds of other activities offered, one particular activity still jumps out at me…..SWIM. Swimming is an amazing activity. Whether you are learning to float or paddle or working on your backstroke, it’s great exercise. It builds strength and develops muscles. It also develops the overall body’s tone and balance. Many great athletes, across many sports, started with simple swimming instruction that developed into year-round swimming. Swimmers often are able to train longer than most other athletes while performing their sports since training in water eases stress on the joints. 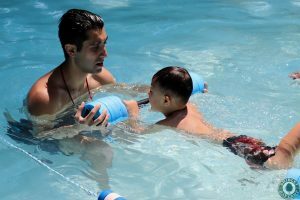 Shibley is home to four heated pools staffed with Water Safety Instructors (WSI), American Red Cross and Nassau certified Lifeguards. 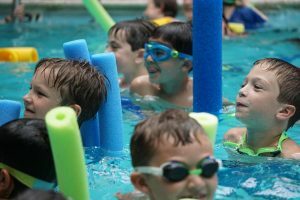 My own four children learned to swim at Shibley and that is why I am dedicated to teaching all of the campers the FUNdamentals and skills of swimming! 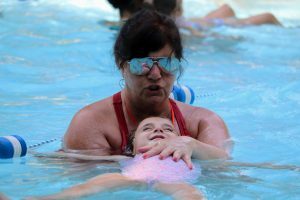 My next post will describe the skills we teach every day in our pools at Shibley Day Camp.